My friend Miyo finished his respin last night. It is without any hesitation that I published its ISO on the download page. I do not know anyone included me who has invested so much energy to produce such a custom ISO. Download it and try it there. This is a great honor Thierry; thank you! Your "icon-fix" helped me realize my mistake in leaving out a specific file from the Home folder. I know this is a fast turn around, but I've rebuilt the .iso and am uploading it to the Sourceforge site. The icons and theme displaying correctly is now fixed in this new .iso. I will post again when they are available. I'll also upload updated "Release Notes" and checksums. Okay, the new .iso is now available on the Sourceforge site...along with the updated Release Notes and checksums. I'm not sure if I should post that link here or not. Thierry, my apologies if this causes you extra work in uploading new files. Using it for quite some time now, and loving it . Only Issue I am facing on it is that time does not synchronize for me. Will there be a new version released ? Yes, I plan to make a new version, but it might be awhile before I'm able to. I still haven't gotten around to installing the new version of NuTyX yet for myself!!! 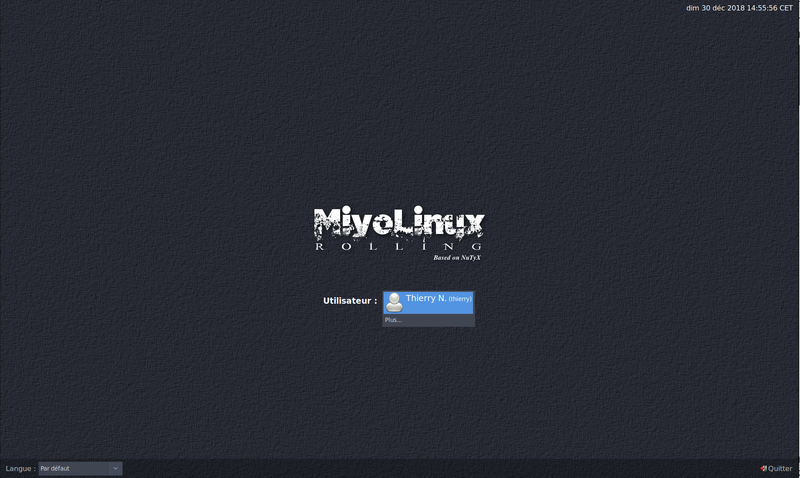 Just noticed MiyoLinux-Rolling_x86_64_20190406.iso on sourceforge . Are these new ISO files based on Nutyx 11 ? And will be this version a true rolling release this time? No sir...those are based on Devuan's unstable branch, which is equal to Debian Sid. Updating the NuTyX version to 11 is my next thing to do. Still, it will be a month or possibly two months before I'm able to do it, because I have a lot of things to take care of for my job. Maybe Thierry is able to answer the rolling release question, because I'm ashamed to say that I'm not sure. With the permission of Miyo, I removed the Miyo Openbox ISO as it was not possible to upgrade it to the 11.X version of NuTyX. I took the chance to add an new MATE 64 bits rolling version instead.